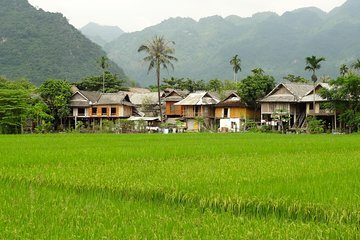 Explore the traditional villages and beautiful countryside of Northern Vietnam on this full-day tour of Mai Chau from Hanoi. Enjoy a spectacular drive through the mountains, cycle around the scenic rice fields, learn about life in Vietnam, and stop for lunch in a typical stilt house. Begin your day with a 7:30am pickup from your central Hanoi hotel and soak up the scenery as you drive west into the hills of Northern Vietnam. The journey to Mai Chau takes around 4.5 hours, but there will be plenty of stops along the way to gaze out across the valleys, visit traditional villages, and take photos. Arrive in Mai Chau around midday and follow your guide to a traditional stilt house, where you’ll be treated to a scrumptious lunch of typical Vietnamese cuisine. After refueling with lunch, set out to explore the village and the surrounding countryside on a leisurely cycling tour. Along the way, pause to admire local handicrafts, watch demonstrations of age-old weaving techniques, and see farmers working in the rice fields. Around 3.30pm, set out on the return journey to Hanoi, where your tour ends with a drop-off at your hotel around 8pm.